Disagreement among United Right leadership following New Right's claims of irregularities in counting of soldiers' votes. 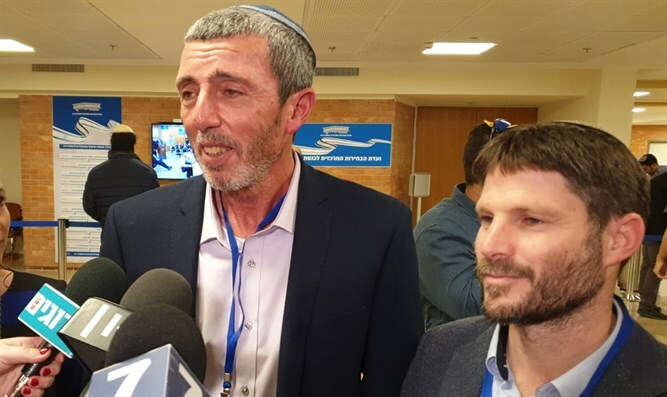 The chairman of the Jewish Home, Rabbi Rafi Peretz, responded to reports and claims of irregularities in the counting of votes in the Central Elections Committee. "In recent hours, we have been relying on endless rumors about the counting of the soldiers' votes. I have full confidence in Judge Hanan Meltzer and we will wait responsibly and with discretion for an official announcement from the Elections Committee," said Rabbi Peretz. On the other hand, National Union Chairman MK Bezalel Smotrich said, "We will join the demand of Shaked and Bennett to recount the soldiers' votes." "There is a very rotten smell here of a deliberate attempt to conceal right-wing votes, and it is absolutely forbidden to let this happen," he said. Earlier Thursday, observers on behalf of the New Right Party reported vote counting irregularities in the Central Elections Committee. "By six in the morning, the New Right received the votes of soldiers who put them in the Knesset with four seats and the right-wing bloc grew to 67," the observers note. "Suddenly, the entry of observers was stopped, the election committee's website got stuck, the New Right's numbers suddenly fell, and the New Right was pushed out of the Knesset. Meretz received another mandate from the soldiers, and the Rightist bloc fell from 67 to 64." Following the claims, party officials said, "We'll demand a recount and we won't allow any ballot box monkey-business."